THE PICKIEST EATER IN THE WORLD: WELCOME TO THE PHILIPPINES, JAMBA JUICE! WELCOME TO THE PHILIPPINES, JAMBA JUICE! So it's been almost a month since Rina gave birth to our beautiful daughter, Rain, who with the grace of God was delivered in good health for both Mother and baby. With no disrespect to all the other babies out there, but she is the most beautiful baby I have ever seen in my entire life (I'm biased, I know). I'll be writing about that experience soon, but this time, I wanted to share with you another story. The night Rain was born was only Schatzi's second time to sleep without us in the same room with him (The first time was when we were in Singapore). According to our helper, he cried the entire night. As soon as we got out of the hospital we stayed a couple of weeks in my parents place in Antipolo. We brought Schatzi along with us so he could play with his brother, Spike (owned by MY brother, Ryan). Our plan was to keep him busy so he doesn't feel like we're neglecting him. With Spike there, it was easy to keep Schatzi pre-occupied (The two of them would rumble around to the point where they look like just one big ball of fur). But as soon as we got back home, it was clear that Schatzi was looking for the attention that we would shower on him in the past. With Baby Rain in still such a delicate stage, we don't allow Schatzi in the room anymore. In fact, we don't allow him upstairs anymore. I love Schatzi deeply but it's obvious that he's not the most hygenic creature in the world. You can tell he's feeling a little bit sad, yet he lights up the minute one of us calls out his name. Last Sunday morning, Rina and I decided to take Schatzi for a change. It wasn't easy leaving Baby Rain and home, but she was sleeping so soundly, and we knew we would only be gone for an hour or so, so we headed off to one of our favorite places to take him, Bonifacio High Street. I realized it would be the best time to try the recently opened juice bar in the new section of High Street, the world famous "Jamba Juice". 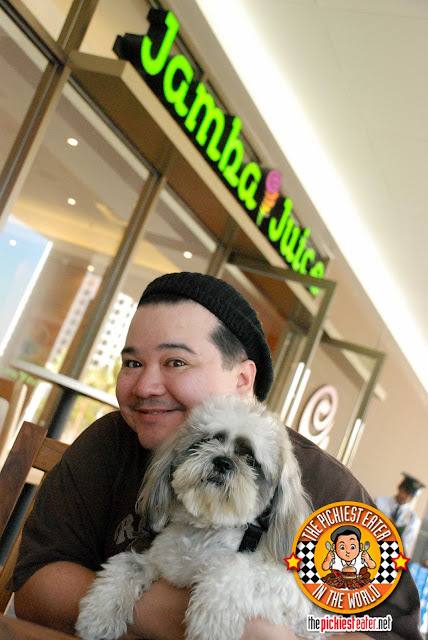 I first heard about the arrival of Jamba Juice to our shores through my cousin, Paolo. He gave me the heads up that the Max's group that brought Krispy Kreme into our country (God Bless their souls) was bringing them too. I have to admit, I wasn't really familiar with Jamba Juice's work, because as you can imagine from my previous posts, I'm not exactly a Healthy Fruit Shake kind of guy. But Rina, on the other hand, loves the stuff. She can't resist Fruit Magic and the like, so when I told her that Jamba Juice was supposed to be the Cadillac of fruit juices, she was sold. The restaurant is located at Bonifacio High Street Central, which is right across from "ROX" (which is near Texas Roadhouse Grill). As of this writing, Jamba Juice is the only establishment that I saw open in that area, but that's bound to change quickly. For a newly opened establishment, I've got to say that they're running like a well oiled machine. The Jamba Juice crew are easily the happiest people on Earth. This was the epitome of "service with a smile". You walk into the place, and they just light up, and all of a sudden you are the most important human being on the planet to them. And they would keep things casual, when talking to you. When asking for suggestions on what Juice I should get, I felt like I was talking to a friend, and now a member of Jamba Juice's staff. I could imagine myself lounging here all day! A nice touch to the place was the presence of a Photobooth, where you can take pictures of yourself with your friends, and email it straight away to your email account! Unfortunately for us though, Rina has yet to receive the picture of us that she emailed to her account. Jamba Juice takes pride in offering only fresh ingredients, without any of those high fructose corn syrup and other artificial flavors. In my first attempt to go for a healthy fruit smoothie, I tried their Strawberry Whirl (P150 Small), which consisted of Strawberry, banana, and Apple-Strawberry juice. It was actually quite refreshing and the tanginess of the strawberry was tamed down by the presence of the banana. In all honesty, I couldn't pinpoint the taste of the apple-strawberry juice, needless to say, this was rather delicious. Rina asked me to choose her drink for her, so I got her the Strawberry Surf Rider (P135 small) which is made up of Strawberry, Peaches, Lemonade and Lime Sherbet. After placing the order, I immediately realized I chose the wrong thing because they would look identical in pictures, except my Strawberry Whirl looked a bit lumpier (I had to choose something without bananas, which was pretty difficult to do). Taste-wise, The Strawberry Surf Rider had a flavor similar to that of its cousin, the "Whirl", except with a much higher acid content brought on by the presence of its lemon and lime components, which was a bit too strong for my liking. I actually could have changed this afterwards, as Jamba Juice offers a "Goodness Guarantee" (you can exchange your drink if you're not happy with it), but I couldn't in good conscience return a perfectly good drink that had absolutely nothing wrong with it, except it wasn't compatible with my taste buds. After all, I did choose it myself. I wasn't going to leave Jamba Juice without trying their Creamy Smoothies, so after downing my "Swirl", I decided to share a Chocolate Moo'd (P150 Small) with Rina. I'm not a big fan of Frozen Yogurt, but this was one of the best "Healthy" drinks I've ever had in my life. The chocolate was rich and creamy, and if it was completely frozen, I have a feeling it would have tasted like those Chocolate Cream bars they used to sell in Coney Island. (I was so crazy over those!) Like the yogurt offerings of Golden Spoon, the Chocolate Moo'd didn't taste like it was made from Yogurt. It could easily have been called "Ice cream" to me and I wouldn't have noticed the difference. The next time I go back to Jamba Juice, i'm going to be trying the Peanut Butter Moo'd! Every Smoothie order has the option to reserve a complimentary "boost" if desired. I wasn't planning on feeding Rina just Health shakes for breakfast, so I ordered her some Steel Cut Apple Cinnamon Oatmeal (P95). I have no idea why they're "Steel Cut", but this got Rina's stamp of approval. She was telling me that she's not really fond of oatmeal, but she couldn't stop munching on this. The apple bits were chopped up so finely into the oatmeal, so that the flavor pops into your mouth. The sprinkling of the brown sugar gave it a lightly sweet tinge into it as well. The only thing I found strange was that they topped it off with Bananas. I don't know if that's the standard, but I wasn't asked what I wanted on it, but I know I wouldn't have chosen bananas because Rina isn't supposed to be eating them yet. But at any rate, it was easy to discard, so no harm done. To get us something heavier into our bellies, I ordered the Smokehouse Chicken Flatbread Pizza (P140). I'm not usually into Mexican style dishes, but I really enjoyed this. The combination of the smoked chicken, beans, peppers and tomato sauce brought the dish together with a symphony of beautiful colors, but the main event for me had to be the flatbread itself, which was nothing short of amazing. The Flatbread was delicately soft and virtually melted in your mouth with every bite. My only curiousity was if the bread was supposed to be crispy, because it was not. I think I read in the description that it was supposed to be.Who cares though, because I liked it as it is. If this is what "Healthy Eating" tastes like, then I should have been Mr. Universe a long time ago! I didn't have the same pleasant experience with Jamba Juice's Spicy Chorizo wrap (P136), however. Don't get me wrong.. It wasn't that bad. The wrapper didn't seem like it was made of whole wheat, though the color may have given it away, but more than anything, it seemed like Spicy tomato sauce wrap than a Spicy Chorizo one. The tomato flavor was a bit too overpowering for me. The small bits of chorizo did have heat to it but it was manageable for me (And I usually can't handle spicy stuff). I'll stick with the flatbreads next time. I really had an amazing time at Jamba Juice not just because the smoothies were excellent and the food was delicious, but because I could enjoy it all without feeling guilty about what I'm doing to my body for breakfast (Although I did feel like I was cheating on bacon a little bit). But what made my first time at Jamba Juice a memorable experience was the amazing staff. I genuinely had fun there, and I would not hesitate going back.. hopefully next time with Schatzi and Rain! she was more intent on going home back to Baby Rain. PS: Schatzi seems like a really sweet dog! Our shih-tzu's -- Butters (super masungit), and Oreo (super lazy), are not so sociable though. Since I'm not a huge fan of fruits, the standout for me was the chocolate! i liked the apple cinnamon oatmeal! !